James Keiser signing a locker made by HUNCH students. 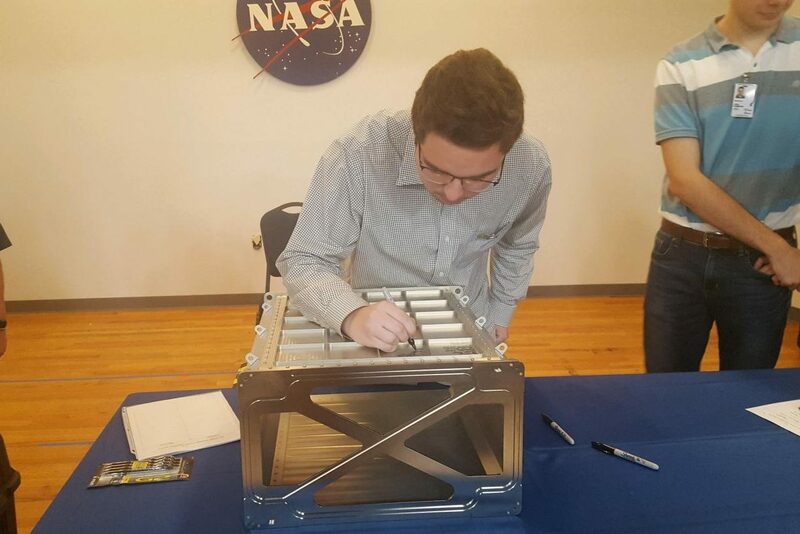 After a full school year of working on their projects, the students involved in High Schools United with NASA to Create Hardware program, commonly known as HUNCH, have visited the Johnson Space Center to receive their final review of their products. Senior James Keiser started in the engineering class his freshman year and later started participating in the HUNCH program. Culinary, fashion design and other various classes have all participated in some aspect of the HUNCH program, but the manufacturing and creation of the products presented at the space center were created by students in the engineering manufacturing class, including Keiser. The HUNCH program utilizes high school students to create various items needed for NASA projects to go into space, and the students meet with their NASA advisor regularly to get feedback on their items and fix what is needed. At the final review, Keiser and his partner were critiqued by astronauts and engineers.